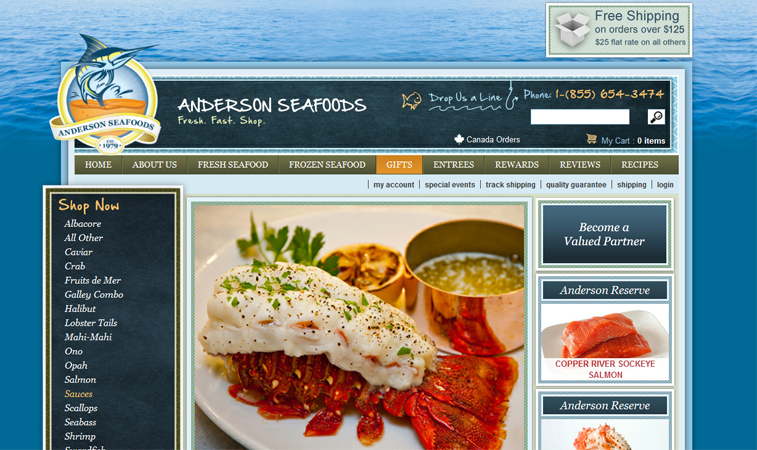 If you like seafood and like picture than shopandersonseafoods.com is definitely the website for you. If you know of Anderson Seafoods you probably know them for supplying top quality seafood to restaurants and markets. Yet, today Anderson Seafoods has taken their fish and delivered it next day straight to your doorsteps. Being a food lover, with seafood at the top of my favorites list, I found it difficult to work on the website without finding myself studying the amazing looking fish and lobster pictures. One of the cool parts of this project was working with UPS and Anderson Seafoods that would take fresh seafood and get it into the hands of the entire nation within one day. As you can imagine there were some custom features that had to be created as well as modifications to accomidate this functionality, but as you can see in the video below, the work was well worth it.